The Trump administration confirmed this summer that sonic frequency attacks of an unknown origin had caused medical issues with multiple American diplomats, most of whom returned from Havana following their diagnosis. The State Department has yet to specify what sorts of medical issues the diplomats experienced, but reports in mainstream American media outlets citing informed sources say the high-frequency sounds have caused nausea, severe headaches, “concussion-like” symptoms, and brain damage. The Cuban government denies any involvement in the attacks and claims to be aiding the investigation into the incidents. The Trump administration has not indicated it will shut down the U.S. embassy in Cuba, which only became fully operational for the first time since the bloody communist revolution of 1959 following Barack Obama’s announcement of a “normalization” process with the Castro regime. According to the U.S.-based Martí Noticias, Nauert said in a statement that the 21 confirmed cases of illness in relation to the “incidents” all occurred before September 1, and none was new. She added that more cases could arise in the future but not because she expected more attacks, but rather because the nature of the symptoms is so varied and subtle that it may take some time for those affected to conclude that what they are feeling is related to the attacks in question. Nauert also reiterated that the United States has made no conclusions regarding the origins or nature of the attack. When first confirming the attacks, the State Department claimed that they had begun in late 2016 and not persisted into August, when news first broke of the incidents. By the end of the month, however, the department confirmed that it had found evidence of continuing attacks into August. On Tuesday, that number increased to 21. The Trump administration has indicated it would take a more aggressive stance than its predecessor against communist Cuba, a serial human rights abuser and ally of such rogue nations as North Korea and Venezuela. It has not, however, moved to close the embassy in Havana or the Cuban embassy in Washington or significantly pressured Cuba on human rights yet, merely limiting some tourist travel from America to the island. 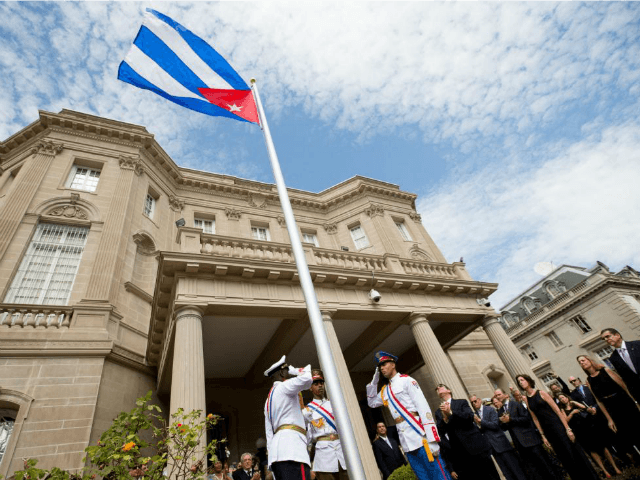 Following the discovery of the sonic attacks, Washington asked Havana to withdraw two alleged diplomats at the Cuban embassy, which the Spain-based Diario de Cuba identified as two intelligence agents.